The town had seen a number of motorists having their cars damaged with items stolen from them or even the cars themselves taken. The local police were asking people to be more vigilant and not to leave any valuables in unoccupied vehicles. After this recent spate of unsolved crimes the police also confirmed that the Manchester Road area had become the car crime capital of the town. Car thefts weren't the only problem and in one Padiham incident no fewer than six young Burnley men were committed to Burnley Crown Court with causing violent disorder. They were lucky too; they received discharges for further offences of possessing baseball bats, a metal pipe, a snooker cue and a craft knife as offensive weapons. The police were busy, no doubt, but for one retired police officer in town it was a time to say farewell to another organisation. Sixty-year-old Ken Tomlinson had been captain of 1st Burnley Boys' Brigade at Greenbrook Methodist since 1952 but had decided it was time to hand over. "it's time, after so long, for a younger man to do the job," said Ken, who, in 2012, is still very much a committed Burnley supporter and season ticket holder along with his son and grandsons. His son appears regularly on this site's message board with his regular negative comments on the goings on at Turf Moor. Ken, I can confirm, is much more positive. Elsewhere there was news that Burnley's historic Queen Street Mill had been saved until into the next century following grants of £600,000 from English Heritage and £200,000 from the National Heritage Memorial Fund. Today, it remains the only surviving operational steam powered weaving mill in the world. In the world of sport, Burnley Borough Council hoped to make Burnley the most sporty town in the North of England. The year had been designated 'Year of Sport' and a challenge had been thrown down by BBC North West Tonight. It was very definitely a challenge taken up by the local council who wanted the townsfolk to get out there and play sport. They even launched the slogan, "Marbles, golf, tiddlywinks, football or karate - just do it." Football was very much one sport on everyone's lips with the Clarets going into the big game on the back of three successive league wins against Aldershot, Doncaster and Chesterfield. Those three straight league wins had lifted Burnley amongst the high fliers and only opponents Crewe Alexandra were above them. It proved to be an extraordinary match; one that produced two red cards, an own goal, a couple of blunders in front of goal, but sadly not the win that would have seen Burnley go top of the league and the team only had themselves to blame after 90 minutes when they should have done just that. Burnley had been the better side in the opening exchanges in a game that, overall, was a superb advertisement for Fourth Division football. Burnley piled forward from the start. 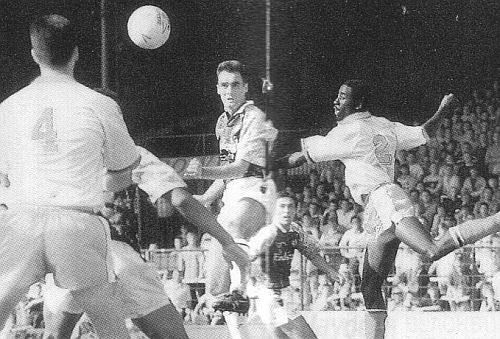 Roger Eli came close, as did Mike Conroy, but then Crewe really should have gone in front. Steve Garvey's cross evaded everyone apart from former Claret Ron Futcher who looked a certain scorer until John Pender managed to get his body in the way of the shot and block it. 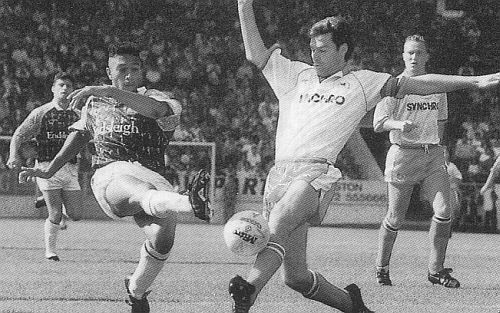 Futcher, playing against Burnley just weeks after his contract at Turf Moor had been terminated, was very much in the thick of the action just past the half hour. He was far from happy after being brought down by Mark Monington. Referee John Key saw nothing in it; had a word with Rocket Ron over his play acting, and got on with the game. Just two minutes later and Futcher scythed through Steve Harper. This time Key did give a foul. Ron wasn't happy and had a word, and out came Key's red card for foul and abusive language. It was still goalless at half time but just seven minutes into the second half the opening goal went in Burnley's favour. John Francis got behind the Crewe defence with his blistering pace, only to be brought down by Rob Jones on the right touchline. The free kick was taken by Andy Farrell who struck it hard and low and when FRANCIS nudged the Clarets in front they were commanding top billing. Unfortunately, the lead lasted just two minuteS. David HAMILTON had one of those days in what was one of those seasons for him, a collector's own goal to equalise. He was later red carded into the bargain. Alex' goalkeeper Dean Greygoose unleashed a huge clearance. Monington totally misjudged the ball and, as it dropped, Hamilton, under pressure from a Crewe forward, could do no more than lob it over Andy Marriott and into the Bee Hole End goal. Conroy twice had the chance to restore the lead. He hit the underside of the bar but then missed the simplest of chances. With just Greygoose to beat he placed his shot wide of the post. Just before that, Hamilton's day had come to a sorry end. Garvey was moving forward but Hamilton did well to nick the ball off him and play it back to Marriott. Astonishingly, the referee awarded a free kick and sent off the Burnley player. There was no hint of a foul whatsoever but it ensured that the teams ended the game with ten players each whilst sharing the spoils in a 1-1 draw. Manager Frank Casper was fuming at the end, and said of the incident: "He did not deliberately pull him back. He did not go over the top or hack him down. He went for the ball, won it and played it back to our 'keeper - and he was still sent off. "Rules are rules, but someone has got to sort this one out. Referees should be allowed to use their discretion more than they seem to do." On the performance from his team, Casper added: "We were in the driving seat and should have won the game, but we gave them a sloppy goal and the defenders know that they are responsible for it. "If the players want to do anything in the league, they have got to be a lot tougher and make sure that they get on and win games. We played very well and passed the ball well in the first half and we played well even when Hamilton had been sent off. "But we have got to dictate things more and players have got to demand the ball, and then do the right things with it." He continued: "We had a great chance to win the game in the last few minutes when Mike Conroy missed an easy chance. Only Mike knows how he missed, but over the course of the season I am sure he will score goals from nowhere and miss a few easier chances, good strikers are like that." Burnley: Andy Marriott, David Hamilton, Steve Harper, Steve Davis, John Pender, Mark Monington, Roger Eli, John Deary (Andy Farrell 35), John Francis, Mike Conroy, Mark Yates. Sub not used: Ian Bray. Crewe Alexandra: Dean Greygoose, Gus Wilson, Rob Jones, Jason Smart, Aaron Callaghan, Steve Walters, Steve Garvey, Tony Naylor, Ron Futcher, Mark Gardiner (Aidan Murphy 67), Rob Edwards (Colin Rose 71). A win would have seen Burnley go top, but the point ensured we remained second on goal difference, one of six clubs on ten points, the others being Barnet, Hereford United, Blackpool, Rotherham United and Rochdale. This meant another early top of the table clash a week later with Burnley set to visit Hereford. It was a good day for Doncaster whose 3-1 home win against Wrexham brought them their first points of the season. Kevin Noteman, who had scored a week earlier against the Clarets, hit two of them with Mark Rankine also on the scoresheet. That left Maidstone United, 2-0 losers at Scunthorpe, at the bottom with just one point.